FRANKFURT (Reuters) -- German ball-bearing maker Schaeffler Group stepped closer to a merger with Continental AG, hiving off its healthy operating business into a separate company together with its 75 percent stake in the Hanover-based German auto parts supplier. Schaeffler spun them off and bundled the two into a limited liability company effective on Monday, ringfencing them from the core private partnership saddled with billions in debt. The borrowings stem from its largely botched attempt to acquire control of Continental just as Lehman Brothers collapsed in September 2008. "The transformation to an incorporated company is a very meaningful step toward the capital markets. 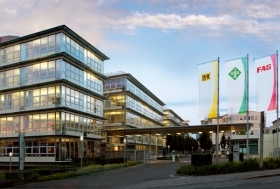 The Schaeffler Group creates additional strategic room to maneuvre with the move," owner Maria-Elisabeth Schaeffler said in a statement. The new Schaeffler GmbH could form the basis for a possible integration of the two, which had fought bitterly with one another over how to work together ever since the deal went through. Continental ranks No. 4 on the Automotive News Europe list of the top 100 global suppliers, with sales to automakers of about $18.7 billion in 2009. Schaeffler ranks No. 38 with sales of $3.8 billion last year.